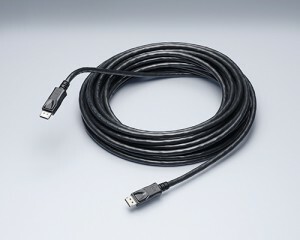 Reduced Bit Rate (RBR) cables will support only one monitor up to 1080p (resolutions of 1920x1080 or 1920x1200), but these are generally restricted to projector installation applications and very long cables. Read the packaging of each cable for more information. All restrictions should be clearly indicated on the cable packaging. The DisplayPort data bandwidth represent the maximum information (in gigabytes per seconds) each version of DisplayPort can send to the output. Because of this shared bandwidth, it is possible to connect many monitors of different make, model, resolution and refresh rate on each cable. The total bandwidth of Reduced Bit Rate connections is 6.48 Gbit/s, the Video Data Rate being 5.18 Gbit/s. Note: Cables longer then 10 feet (3 meters) will usually have the Reduced Bit Rate bandwidth, but not always. Make sure to check the product description for more details.